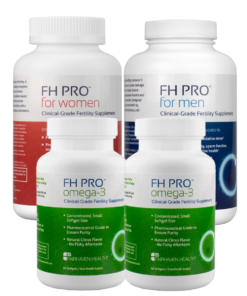 Includes a one-month supply of the antioxidant-rich FH PRO for Men and Women, along with 2 bottles of FH PRO Omega 3. The FH PRO Complete Kit is a convenient and cost-effective way to purchase your His and Hers fertility supplements. The FH PRO Complete Kit includes one bottle each of FH PRO for Men and Women, along with 2 bottles of FH PRO Omega 3 – providing a one-month supply of our clinical grade fertility supplements for you and your partner in a convenient bundle at a reduced price. 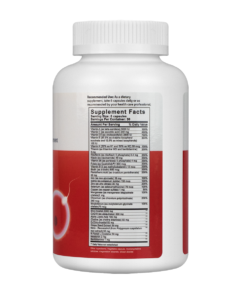 FH PRO for Men is an antioxidant-rich supplement that supports fertility by reducing the damaging effects of oxidative stress on sperm health. Oxidative stress is a leading cause of male infertility, as it leads to decreased sperm count and motility and causes damage to sperm DNA. In addition to providing effective dosages of key fertility ingredients including CoQ10, L-Carnitine, Zinc and Arginine, FH PRO for Men provides complete multivitamin support. For optimal results, men should begin taking FH PRO three to six months before trying to conceive naturally or starting an IVF protocol. For more information, please see the FH PRO website. FH PRO for Women is a doctor-formulated dietary supplement designed to promote egg quality, ovarian function, and overall female fertility. Aimed at preventing oxidative stress, FH PRO for Women includes an array of antioxidant nutrients, including CoQ10, Vitamin E, and alpha lipoic acid, to protect egg cells from the damaging effects of age and environmental toxins. 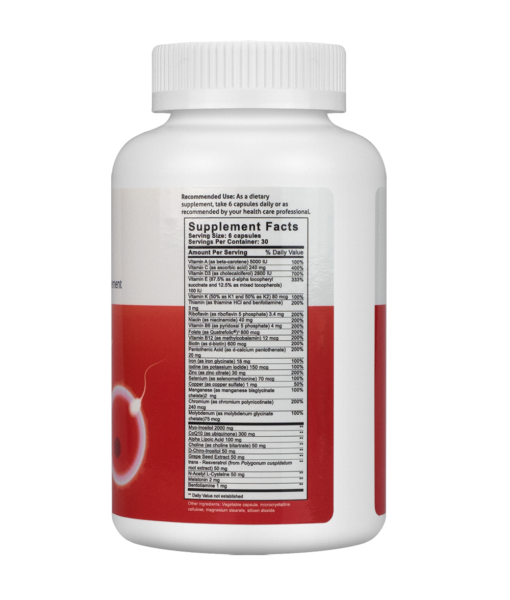 FH PRO also includes full preconception vitamin support, along with myo-inositol and d-chiro inositol to promote hormone balance, insulin sensitivity, and ovarian function. 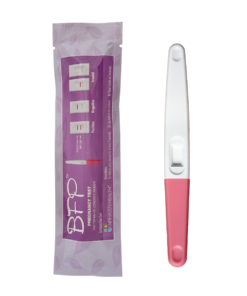 For optimal results, women should begin taking FH PRO three to six months before trying to conceive naturally or starting an IVF protocol. For more information, please see the FH PRO website. 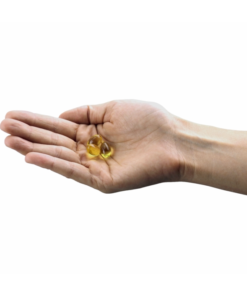 FH PRO Omega 3 provides two type of omega 3 fats that are especially important for fertility: EPA (eicosapentaenoic acid) and DHA (docosahexaenoic acid. In women, EPA and DHA are believed to help regulate hormones, reduce inflammation, promote cervical mucus production, and reduce blood clotting , all of which is beneficial for fertility. EPA and DHA are also believed to be important for helping to prevent miscarriages and preterm labor and for brain and eye development in the fetus. In men, low intake of Omega-3 fats has been associated with poor sperm production and quality. FH-Pro Omega 3 has a light citrus flavor to mask any fishy taste, and contains oil only from small fish, including herring, mackerel, sardines and anchovies, caught in the cold water of Iceland using sustainable fishing practices. 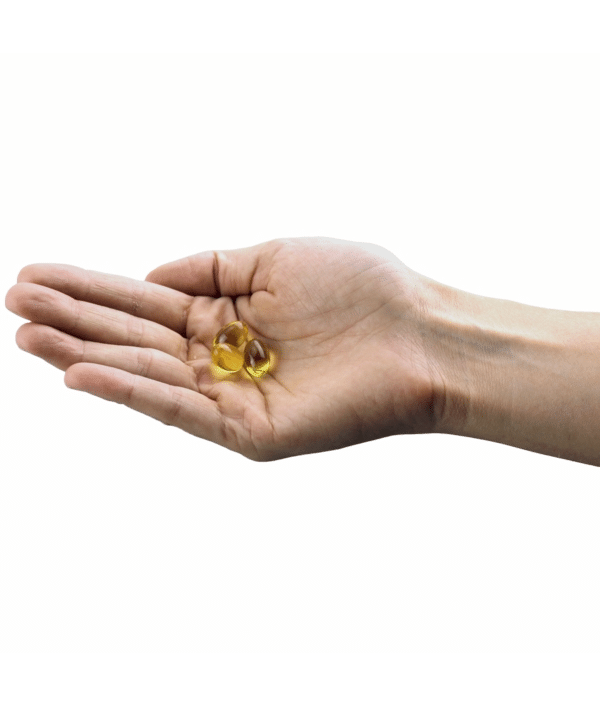 The EPA and DHA-rich oil is then processed in a GMP (good manufacturing practices)-compliant facility to remove heavy metals and pesticides, resulting in premium quality fish oil that is pharmaceutical grade and meets or exceeds all official regulations related to environmental contaminants. Save 15% on multiple bundles! 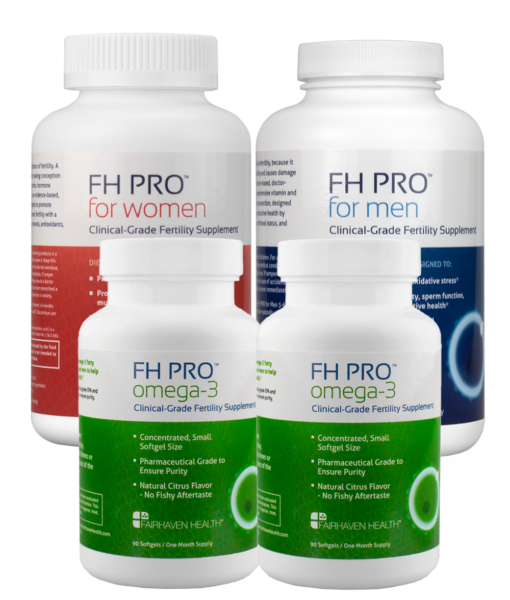 The FH PRO Complete Kit includes a one-month supply of FH PRO for Men and Women, along with 2 bottles of FH PRO Omega 3. No herbal ingredients and no ingredients hidden in a proprietary blend – can be used in conjunction with assisted reproductive technologies, such as IVF. 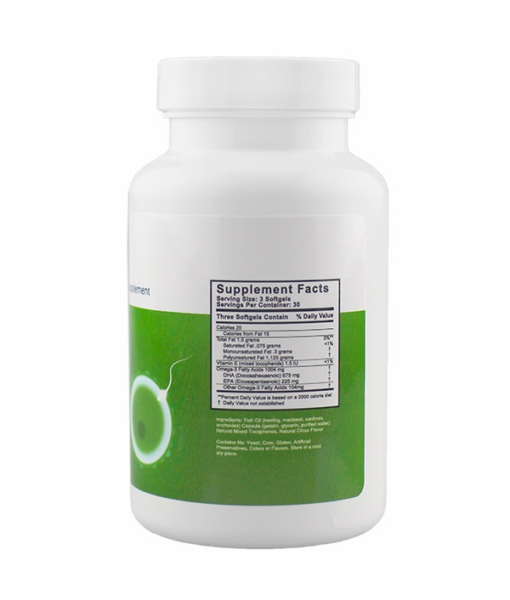 Antioxidant-based supplement to reduce oxidative stress, improve sperm function, and enhance male reproductive health. No herbal ingredients and no proprietary blend – can be used in conjunction with assisted reproductive technologies, such as IVF. No, you do not need a prescription for use. While, FH PRO for Women is a clinical grade dietary supplement, designed to be recommended by fertility specialists as part of a specific fertility protocol, any trying to conceive couple can use the supplement to optimize their reproductive health. When should I begin taking FH PRO? Should I take FH PRO for Women or FertilAid for Women? Unlike FertilAid for Women, FH PRO does not contain herbs. While the herbs in FertilAid for Women help to promote hormonal balance, some fertility specialists prefer that their patients who are undergoing IVF or other assisted reproductive technologies (ART) do not take herbs. Ask your healthcare professional if he/she recommends that you take herbs or not. 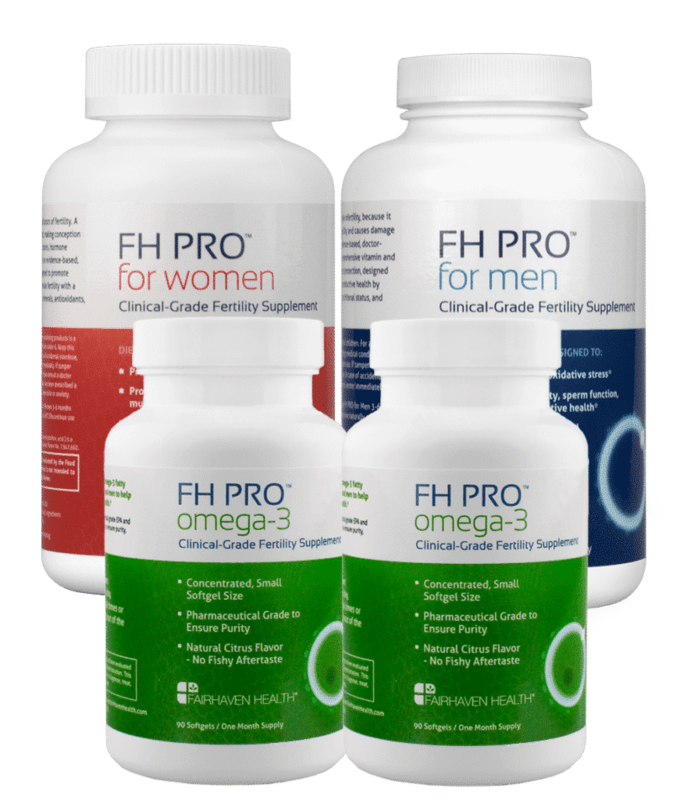 FH PRO contains a broader array of antioxidant ingredients, at higher daily doses, than FertilAid for Women. For example, FH PRO contains 300 mg of CoQ10, 100 mg of alpha lipoic acid, 50 mg of grape seed extract, 50 mg of trans-resveratrol, and 50 mg of n-acetyl-cysteine. FH PRO for Women contains myo-inositol and d-chiro inositol in the well-studied ratio of 40:1 to help improve insulin sensitivity. FH PRO for Women also contains n-acetyl-l-cysteine, which improves insulin sensitivity and lowers testosterone levels in women with PCOS. If you have PCOS, FH PRO for Women is a good choice for you. What is primarily the difference with FH Pro and OvaBoost? The primary difference is that FH PRO for Women offer complete preconception vitamin and mineral support, along with the ingredients that help to promote egg quality and ovarian function. 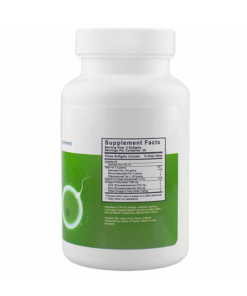 FH PRO also contains d-chiro-inositol along with myo-inositol. Some women will prefer that combination. In general, FH PRO has everything that OvaBoost offers – antioxidant support and myo-inositol (plus d-chiro-inositol) for insulin sensitivity, along with the full vitamin/mineral component. Does this product also serve to detox and remove toxins from your body? Therefore, FH PRO is a complete supplement that a woman should take to detox as well as contain a complete prenatal vitamin supplement? That is correct! You do not need to use FertileDetox or PeaPod Prenatal when using FH PRO. 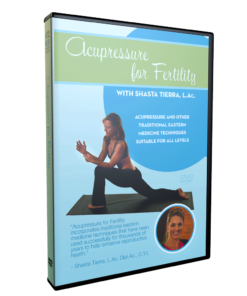 This is a complete, clinical-grade supplement for you as you are actively trying to conceive naturally or during ART. Can this product be taken together with Myo-Inositol or Myo-Folate? FH PRO contains both myo-inositol and d-chiro inositol, both of which have been shown to improve insulin sensitivity. We included these nutrients in a ratio of 40:1 (2000 mg of myo-inositol and 50 mg of d-chiro-inositol) which is supported in the scientific literature, and matches the ratio in which these nutrients appear in the body. We are aware that some experts recommend women take 4 grams of myo-inositol per day. 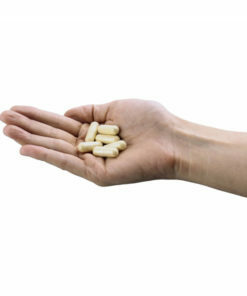 There is certainly no harm in taking additional myo-inositol, but, please do note, that the 40:1 ratio is lost if you take additional myo-inositol. As such, we would recommend that you do review use of additional Myo-Inositol with your physician. FH PRO has no known side effects. However, as with any dietary supplement, if you have a pre-existing medical condition, we recommend that you discuss taking FH PRO with your doctor. Please consult with your physician before taking FH PRO if you have been prescribed a medication for depression or anxiety, or if you are taking the herb St. John’s Wort, as large amounts of myo-inositol may have additive effects when taken along with drugs and herbs classified as selective serotonin reuptake inhibitors (SSRI) and selective serotonin norepinephrine reuptake inhibitors (SNRI). Please also note that melatonin is frequently recommended as a natural remedy for helping to restore normal sleep cycles in people with insomnia. FH PRO for Women contains a small amount of melatonin (0.33 mg per capsule). When taking in the recommended dosage, we do not expect FH PRO for Women to impact your sleep cycle, or your day time energy levels or alertness. 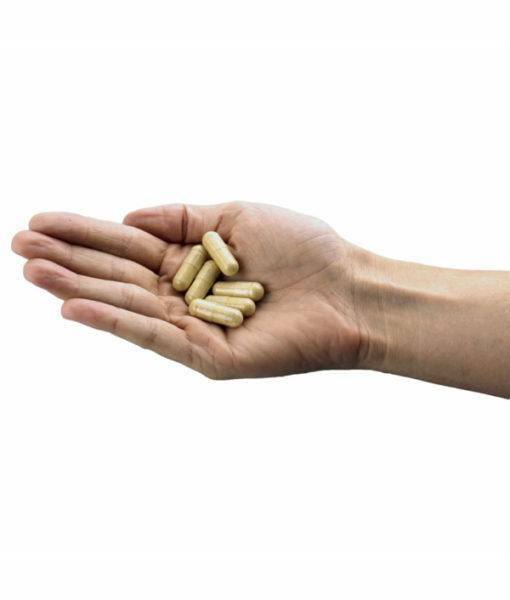 If you notice any change in your daytime alertness, we recommend that you take all capsules just before bedtime. Can you take FH PRO with prescription medications? Prior to use of FH PRO with prescription medicine, we do recommend that you review the complete ingredients list with your prescribing physician. This information can be located on the product bottle or on the website to print for review. Can you take other supplements with FH PRO for Women? FH PRO is a comprehensive, clinical grade supplement. Please review our Women’s Fertility Supplement Guide for feedback on use with other Fairhaven Health products. What is the dosage of FH PRO for Women? FH Pro for Women is sold in a 1 month supply per bottle. You will take 6 capsules daily, and throughout the course of your entire cycle. We would generally recommend you take them in divided doses with meals. Can I continue FH Pro once I get a positive pregnancy test and through to term? 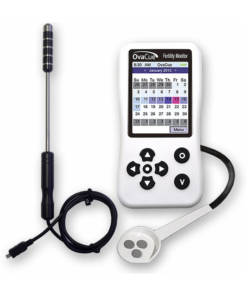 Can FH Pro be used while nursing? No, FH PRO is not recommended for use during lactation. We recommend that you take 3 softgels per day, which provides 675 mg of DHA and 225 mg of EPA. Is the gelatin of the capsules vegetarian? No it is not, the gelatin used in the softgel is sourced from beef. 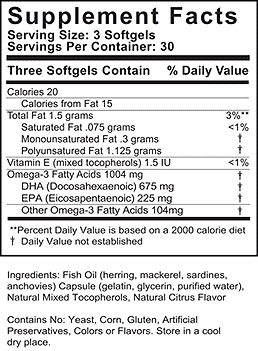 As such, neither the fish oil inside nor the capsule is vegetarian. 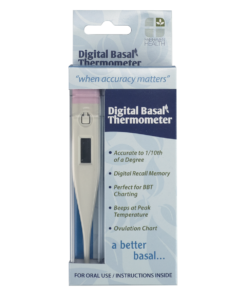 I heard about this product from a few women that I am friends with in the infertility community. After a failed IVF cycle, we were looking for something for both my husband and I to take while preparing for the next cycle. I don’t have specifics on numbers and how these supplements have helped us, but I am hopeful that they are helping to support us with better results next round. I will update once we go through repeat testing. Thank you for your feedback. We look forward to your update once you’ve completed your repeat testing. Wishing you all the best!